Luxury Swiss watch brand Greubel Forsey’s latest limited-edition timepiece could be considered an homage to watch-face inclusion: it appears to leave little out. Available for $820,000, the new Quadruple Tourbillon GMT made its official debut at this year’s Baselworld event. The unique watch is an updated version of Greubel Forsey’s original GMT, which impressed the horology world back in 2013. Forsey watch-watchers will notice the inclusion of two double tourbillons, each set to rotate once a minute. The look is busy, even restless, but fascinating, and augmented with a miniaturized Earth with a fixed 24-hour ring for time telling across the globe. Beyond looking cool, the watch’s design makes for unbelievably accurate timekeeping. And the power reserve is a staggering 72 hours. 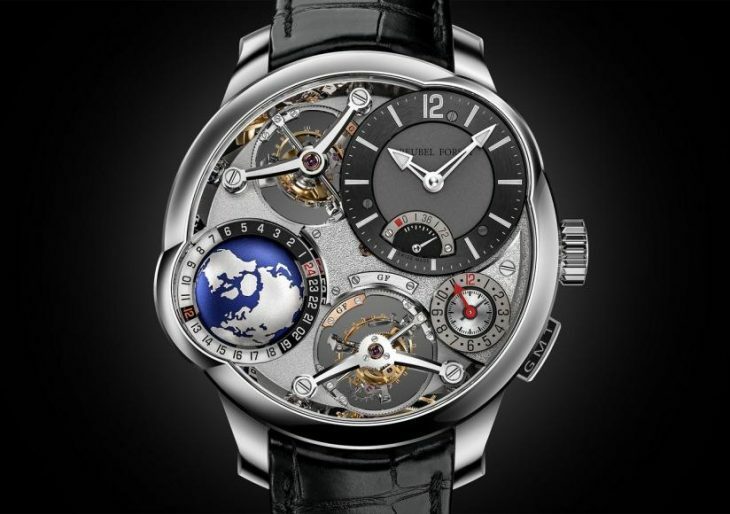 Greubel Forsey has limited production of the Quadruple Tourbillon GMT to just 66 examples.